Global Warming not to blame for toad extinction | Wott's Up With That? “Global Warming not to blame for toad extinction“. Anthony Watts tries to present a Columbia University press release as disproof of the claim that global warming drove the extinction of Costa Rica’s Monteverde golden toad. 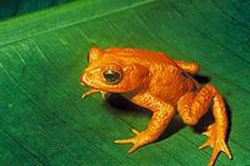 The paper’s disputed conclusion is actually that drying due to El Niño weather patterns allowed a harmful chytrid fungus to spread into the toad’s habitat. The press release says that “proving a link between climate change and biodiversity loss is difficult because so many overlapping factors may be at play, including habitat destruction, introduction of disease, pollution and normal weather variability.” Not too difficult for Anthony to disprove though. This entry was posted in Misdirection by Ben. Bookmark the permalink.